The current Ford F150 Raptor is the highest performance pickup truck in the world right now. The uniquely-tuned, 3.5-liter EcoBoost V6 delivers 450 horsepower and 510lb-ft of torque, with the new 10-speed automatic transmission sending the power to all four wheels via an advanced four-wheel-drive system. Throw in the Fox performance suspension, the beefy tires and the rest of the Raptor-specific aspects of the package and you have an F150 that will beat any stock truck in the world in an off-road race. All of that power makes the Raptor an impressive performance machine on the street as well, but at the end of the day, this F150 was built to dominate on unpaved surfaces. That didn’t stop Vaughn Gittin Jr from making a lap around the Nurburgring and rather than just carefully blasting around the track for the best time – he lapped the famous German road course with the truck sideways. Vaughn Gittin Jr recently headed to Germany with his Ford Mustang RTR to drift the Nurburgring, but when rain coated the track, the idea of sliding around the slick surface in his Monster Energy race car wasn’t all that exciting. Since he was already there, he didn’t want to waste the trip but it wasn’t realistic to play with his Mustang in the rain. Fortunately, Ford came to the rescue with a new F150 Raptor. While drifting a 800+ horsepower Mustang race car in the rain seems more dangerous than fun, a stock Raptor is a whole different story. The advanced four-wheel-drive system coupled with Gittin’s drifting expertise makes the big F150 the perfect truck for playing on a wet road course, so that was what he did. Best of all, there were plenty of cameras on hand on capture the sideways fun. 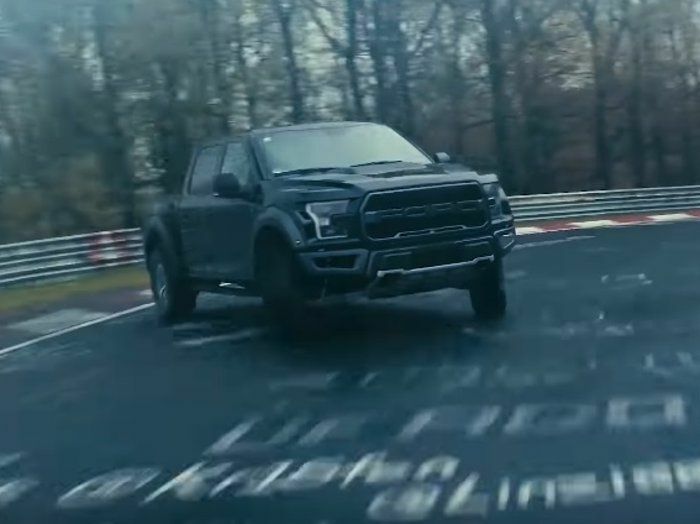 In the video below, we get to watch as the American drift champ roars around the Ring in the new Ford F150 Raptor, and while there is no lap time – this isn’t about getting around the track quickly. This was about Gittin showing how well the highest performance stock truck in the modern market drifts around the world’s most legendary road course.